Cannellini beans have come to the rescue a couple of times this week – once when I needed something to take across the street to dinner that would show off one of the tomatoes we grew in our backyard and then when we had a mom and kid playdate and I wanted a quick addition to a snack-y type table, along with hummus, veggies, crackers, grapes, sun-dried tomatoes and cheese. These little white beans are tasty right out of the can, so you are only seconds from a hearty snack when you have it in your pantry. I think I’ll be using this recipe a lot this winter to add dash and protein satisfaction to otherwise ordinary salads. A delicious salad that makes a meal. Look at those glorious tomatoes. ½ tsp oregano/Italian herbs/your favorite dried herb. Double the quantity for fresh chopped herbs. Place beans and minced onion in a bowl. In a separate bowl or cup, whisk together oil and vinegars (you can adjust vinegars to your personal taste). Pour over beans, add remaining ingredients. mix thoroughly and serve. I am also a huge cannelini bean lover and oft make them this way. Having quite a large herb garden, I use whatever combo takes my fancy on the day 🙂 ! I’ll eat this for brunch with a mug of coffee or roll the mix up in a wrap for my evening meal . . . I like the wrap idea! Do you mash the cannellini into a spread for that? NOTE TO READERS: I will be making a variation on this today…as TOMATO WEEK continues into next week! 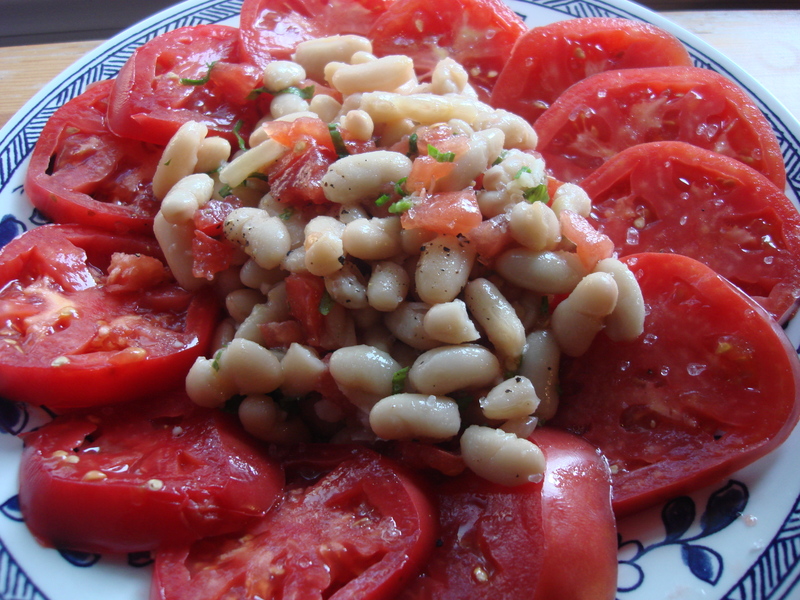 I love cannellini beans. I use them so much, absolutely delicious. This salad looks really awesome, I also happen to absolutely adore tomatoes – particularly at the moment. What great looking tomatoes. This is the perfect way to showcase them. I have some cannellinis calling my name.